Since my last post about heart rate monitors, I’ve had a few more epiphanies. Or, I should say some slap-in-the-face realisations. One: since training began a few weeks ago, I’m hungry all the time! I know, more than normal? I already talk about food all the time, now I carry entire meals in my purse. This is all because my body is working overtime — ordinary work outs, and quantities of food, just don’t cut it anymore. Feed me! 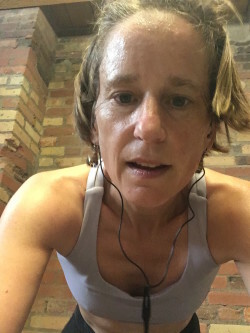 So, last weekend, my partner Karen Duff and I decided to beat ourselves up a bit, test our mettle, put the boots to our bodies, if only to see how our bodies would respond during a race. And mountain biking these distances, something I’ve never done, how do you keep up your energy? How do you stop your body from revolting, seizing up and hitting the wall? So, we went to Sir Sam’s Ski hill near Haliburton to see how many laps of a five km loop we could do; we aimed for 10 laps. The route weaves back and forth up the mountain, through the forest and then back down over some gnarly bone-jolting rock beds and drops. Fun as hell, but by lap three (after a terrible sleep), my legs are heavy. By lap five, my right wrist is numb and tingly from braking so much. Pins and needles kind of feeling. Then, even with my full suspension bike, my lower back is tensing up to the point that instead of getting off the bike with one leg, I pretty much tip over. We make it to about eight and a half laps. Not too shabby. These bodily failures are exclusive of the internal fatigue (your head is saying, ‘get off the freaking bike’), and nothing to say of my concrete legs that by lap five are really starting to ‘bubble’ and flinch around the quads. “Karen, what does it mean if the back of your head is cold?” She didn’t have an answer for that one! My body is going through a metamorphosis and it’s all new to me! To preface all this: eat every half hour during a race. I often forget, and I often underestimate how much I need. And you often don’t feel hungry until it’s too late– you’ve hit the wall and it’s hard to recoup your energy. Think of this: during my four hour ride last week, I burned almost 1,500 calories. Some people suggest an alarm to remind you to eat… whatever works, but get it in ya! So, all this is to say that for every athlete, different things work, but there are a few truisms I have learned: drink all your water an hour before the race as you want an empty bladder. For nutrition before the race, I take a Hammer gel (love espresso) about 15 minutes before starting. It’s a boost of caffeine. Actually, I sometimes will have a few sips of coffee (I know it will make me pee, but the caffeine is really a good jolt). And don’t drink that Tim Horton’s crap– drink a proper espresso or real bean coffee. Next, what the hell do you eat during the race? Eating a hamburger on the bike is really messy — pickles and mustard flying all over the place, plus the barf when your stomach can’t digest that fat! Read more about what happens to your tummy during a ride here: Tummy during a Ride. You need fuel like sugars and complex carbs to keep the muscles going. And, as I experiment with different things, know that I’m really trying to stay away from that chemical crap. A vegan friend, who used to run every day and now owns a vegan restaurant, eats chia seeds and lime juice. So, I tried a chia drink with kombucha tea. Runners also swear by it. I have to say, it was a winner–I wish I had it at Sir Sam’s! My energy seems to stay relatively consistent when I drink it. Finally, after the race: beer. haha. That is the old Melanie speaking. But, know that after this kind of intensity, your body is craving protein to repair the muscles you just tore up! Almond butter and banana sandwich? Doesn’t really matter, but get it in you and fast: within the first half hour after finishing the race.